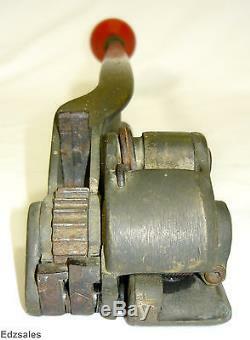 This used tool shows wear from use, and the brass base has some scuffs. 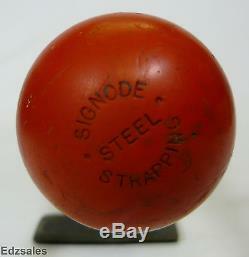 The unit is marked "Signode Steel Strapping", "Signode Tensioner", Mod. T", and "Size: 5/8 to 3/4. The tool measures approximately 14 inches in overall length. To avoid missing details in writing, plenty of photos are included so purchasers can verify items themselves. I want happy customers and I try my best to keep purchasers informed and satisfied. Over time I developed these clear terms to answer questions up front and avoid confusion. Item sells and ships as pictured and described, nothing else is included or provided unless specifically stated. Color in photos may not exactly match physical item due to image rendering differences. Listing title is for search assistance only, written item description and terms of sale take precedence over photos and titles. Purchasing constitutes full agreement and acceptance of all terms and listing contents. Once again, thanks to everyone for your continued strong interest in these sales.. The item "Signode Model T 5/8-3/4 Steel Banding Strap Tensioner Stretcher" is in sale since Sunday, June 04, 2017. This item is in the category "Business & Industrial\Material Handling\Packaging & Shipping\Filling & Sealing Machines\Strapping Machines". The seller is "edzsales" and is located in USA. This item can be shipped to United States.